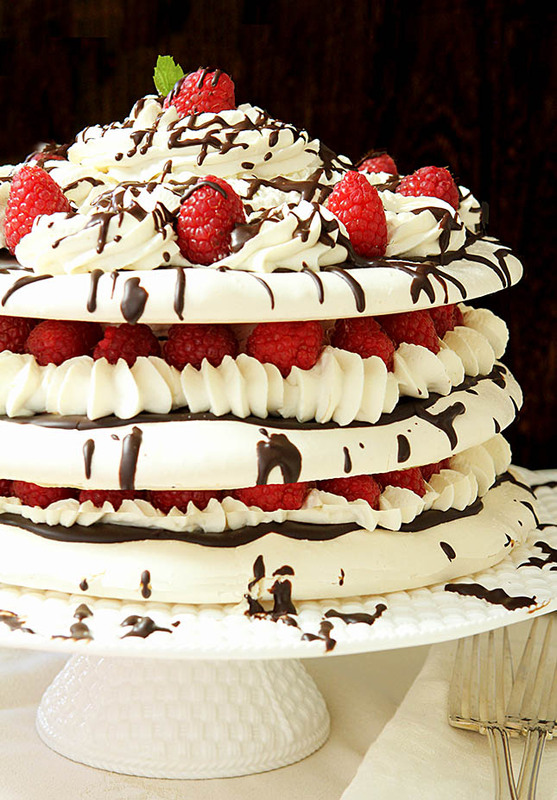 Raspberry and Chocolate Pavlova is actually easy to make but SO beautiful and delicious! Vary the fruits for any season and you’ve got a beautiful winner. I spied this recipe in an old cookbook on my shelves and while I had no idea what the Italian words meant, the look of the Raspberry Boccono Dolce was intriguing so I made it for a party. I later learned from an Italian speaking friend about the meaning of the Italian words boccone dolce and truer words were never spoken. 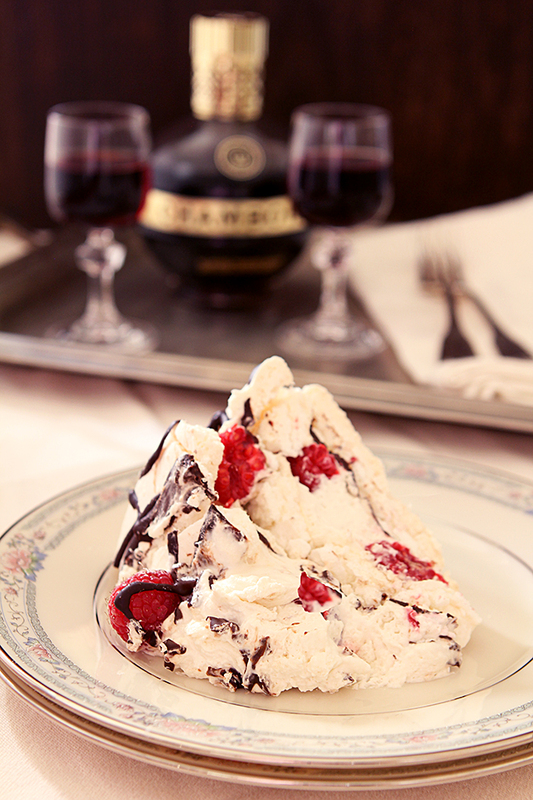 This dessert really is a ‘sweet mouthful.’ Lovely clouds of meringue layered with chocolate, whipped cream and berries. Oh my. More commonly known as a Pavlova for the light layers of meringue mixed with whipped cream and berries, this dessert includes a layer of chocolate ganache and it is truly a stellar dessert for any holiday but this year I made it to share with friends I love on Valentine’s Day hence the red-hearted raspberries. It is so versatile though, don’t limit it to just one day a year…simply changing up the fruit can make it the perfect dessert for any holiday but seriously, why stop at holidays? I had never made it with anything but raspberries until one summer and must tell you that this peach and caramel version I served at a backyard barbecue was perfect with fresh summer peaches. I think my guests wanted to skip the burgers and head straight to dessert! So versatile and really so very, very good! Beautiful to look at (more so BEFORE you slice it! ), wonderful to eat; it’s a dessert you will love to present but the truth is…it’s pretty doggone easy too! I’ve been swept up into the Macaron Madness a couple of times but making those lovely French meringue cookies has been an exasperation for me. So many factors influence their success and since I can’t control humidity or altitude the results have been less than stellar. The truth is that I’ve also never had one that seemed to make all of that effort worth it…give me this dessert in a heartbeat! Today marks another #ComfortFoodFest with my Food Network friends and appropriately the theme is Chocolate! Lots and lots of chocolate; no excuse to not make something for your Valentine! A stunning dessert that is actually quite simple to prepare but will wow your guests! Line cookie sheets with parchment paper and trace 3 circles with cake pan (I used the bottom of my springform pan), each 8 or 9 inches in diameter. Spread the meringue evenly over the circles and bake at 250 degrees for 35-50 minutes, or until the meringues are pale gold and still pliable. Turn off oven and leave in until ready to use or overnight. When ready to use, carefully peel the paper from the bottom. Melt the chocolate with the half and half over low heat and whisk until smooth. Remove 1/4 cup chocolate and reserve for drizzling top. Divide evenly on top of each meringue and smooth; refrigerate until chocolate has hardened a bit. Beat the cream; gradually adding the sugar. Add the vanilla and beat until quite stiff. Place a small dollop of whipped cream on a serving plate and put one meringue on top. Spread approximately 1/3 of whipped cream over the chocolate. Top with 1/3 of the fresh berries. Repeat with a 2nd and 3rd layer; pipe some whipped cream on top of berries and garnish with a few that have been reserved. Warm reserved chocolate if necessary and drizzle over entire cake using either a fork or a ziplock bag with a tiny snip taken off of a corner. The longer you can let this dessert refrigerate before serving, the better. I recommend a 2 hour minimum but more is even better while making sure it is served the same day it is put together. That will give the soft and crunchy meringues time to absorb a bit of moisture and make cutting easier. BUT note...as beautiful as it is and as much as we love it, the beauty of the presentation is certainly not in the individual slices. No matter; I promise no one will complain as they lick their plates clean! This is absolutely beautiful! Love the flavor combination, too. Thanks Jennifer; seriously one of my favorites for those two reasons. Oh and that it really is easy!! WOW, this would certainly be a show stopper! I bet this is a fun one to turn out for company! I love the way you decorated it especially! I only make it if I’m having company and every single time they assume I’ve spent the entire day just on dessert. Shh…don’t tell OK. So much easier than it looks! The photographs are simply gorgeous! Can only imagine how wonderful this must taste. Thanks so much Paula and it is truly wonderful; I simply love chocolate and raspberry together. Barb, I do believe that this is one of the most beautiful Pavlovas I’ve ever seen! 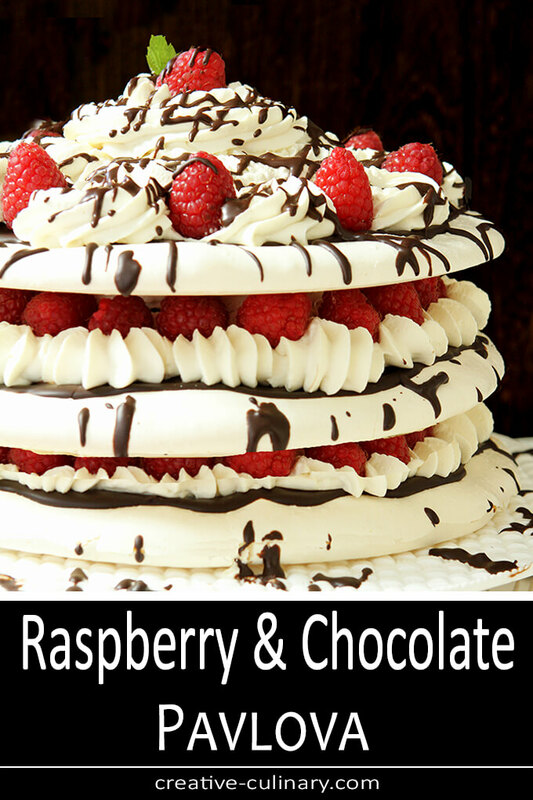 Raspberry and dark chocolate is one of my favorite combinations too – a winner all around. And yes, pavlovas are easier than they look, and incredibly elegant. Thanks so much Laura; it’s why I love it so much too; just two of my favorites in one dish and they do seem made for each other, don’t they? Wow, that is so impressive looking! And I’m excited as it looks super easy to make dairy-free!! Thank you Alisa; is there a dairy free product you can use for mimicking whipping cream? That would be perfect! This looks (almost!) too pretty to eat! But I will…! Your pictures sold me that I MUST try this! Wow! Gorgeous! Thank you Kristen; do try it; you will not regret it. I made another this summer with peaches and caramel sauce…it’s a very versatile dessert! What a gorgeous dessert! I agree about macaroons. I’ve actually personally never made them because they just seem like so much effort and I’ve personally never had one that I really thought was like “WOW i want to spend tons of time on them!” This on the other hand, I’d make in a heartbeat! This dessert would make a decadent dessert for this Valentine’s Day! My hubby would go crazy for it. It’s so gorgeous that I don’t know who wouldn’t go nuts over it though! Your pavlova is gorgeous! I am seriously smitten with them now since having finally made one ( or three since I had to test the recipe a few times ) and I can’t believe how incredibly easy they are yet SO fancy looking. And very very delicious. I love them too; I made one this summer with peaches and caramel sauce. SO yummy! Macarons often leave me flat, too. Look great, but so often there is much taste there. Or even much there there, if you know what I mean. 🙂 This, however, has substance and presence — my kinda dessert! Holy cow, what a dessert. Definitely orgasmic and guaranteed to make the cook a winner with everyone. The problem with this dessert is that you have to ruin it by actually cutting it and eating it! Gorgeous, just gorgeous. Brava!! What a show-stopper of a dessert! My mother in law makes this dessert each time we visit England and I have yet to repeat it here at home. Yours is gorgeous! I honestly think it’s one of the easiest desserts I make and yet it looks like it took all day. Perfect right?